Regulation of telomere length has been proposed to provide the means by which cells count the number of cell divisions from the time of their exit from germ line status. Some mechanism for cell division counting is demanded by the work of Hayflick and colleagues (154), who demonstrated that cultured human cells have a limited capacity to divide in culture. They further showed that cells taken from a young individual have the capacity to divide a greater number of times in culture than cells taken from an older person (155). When cultured human fibroblasts stop dividing, they enter a state termed senescence (Fig. 6). Senescence can be divided into two stages: mortality stage 1 (M1) and mortality stage 2 (M2) (156). M1 occurs when normal replication ends. If the genes involved in maintaining this checkpoint are mutated or blocked by introduction of viral oncogenes, the cells will continue to divide and proceed to crisis (M2). In culture, M2 is characterized by large-scale apoptosis. The observation that M1 and M2 can be prevented by introduction of telomerase (157-161) provides further evidence for a direct involvement of telomere length regulation in senescence and aging. Figure 6 Hayflick's theory of the limited capability of cellular divisions. M1 occurs when normal replication ends. If the genes involved in maintaining this checkpoint are mutated or blocked by introduction of viral oncogenes, the cells will continue to divide and proceed to crisis (M2), which is characterized by large-scale apoptosis in the culture. 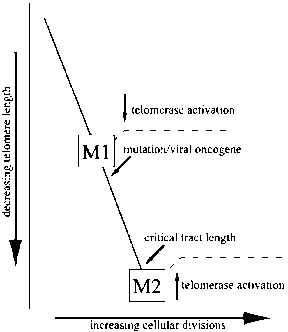 M1 and M2 can be prevented by introduction of telomerase. 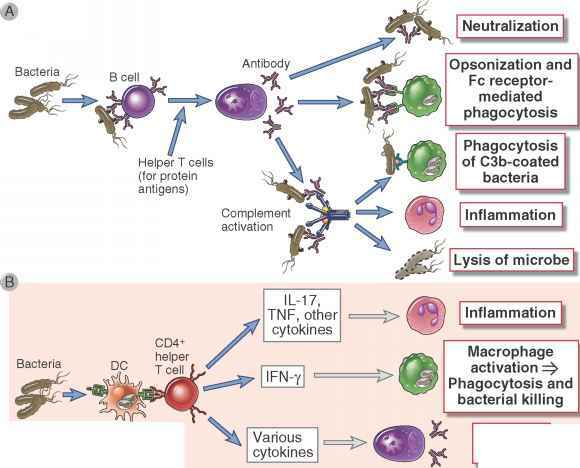 induction of p53, and apoptosis. Whether this is triggered by the passage of one chromosome in the cell past this "gate" or by an average shortening past this value is not known. The existence of a telomere length "measuring stick" raises a fundamental structural problem. In human cells, entry into a nondividing state appears to occur when telomeres decrease in length to ~3 kb. This length of DNA could still accommodate a large number of proteins. Further, it is unclear why the length of the preceding telomeric DNA, be it 3 or 10 kb, would influence telomeric protection, were protection of the single-stranded overhang the critical factor. The answer may lie in part in the ability of long repeat tracts to sequester large numbers of the telomere-binding proteins, in particular TRF1 and TRF2, and further, as discussed in the following section, in the ability of telomeric tracts to assemble into a complex folded structure within the context of highly regular nucleosomal chains. In this section, we review what is known about the effect on telomere length of altering the copy number or function of the major telomere-binding proteins in higher eukaryotic cells. It is not clear that an age/length-counting mechanism similar to that in human cells exists in yeast. Hence these last two sections will focus only on higher eukaryotic telomeres. Studies in which the amounts of TRF1 or TRF2 are artificially increased in cells, or alternatively, in which their activities are greatly reduced, have been carried out by de Lange and her colleagues using two approaches. In one approach, viral vectors have been used to introduce additional copies of wild-type TRF1 or TRF2 into cultured cells. In a dominant negative approach, the fact that both proteins form highly stable homodimers was used to oblate TRF1 or TRF2 activity in cells. First, an inactive mutant of either protein was generated that lacked the Myb domain, and hence would not bind DNA. Introduction of this mutant in excess over wild-type protein is assumed to have driven most of the endogenous protein into mixed dimers with the inactive species. The homodimer, having only a single Myb domain, would thus be inert (100). In these experiments, overexpression of TRF1 was found to cause progressive telomeric erosion at a very slow rate (3-11 bp per population doubling [PD]), whereas expression of a dominant negative TRF1 resulted in elongation of the tract at a faster rate (~35 bp per PD) to a new stable length (100). Telomerase activity was not affected in either case. These results suggest that TRF1 plays a role in telomere length regulation through some negative feedback mechanism. The regulation of telomere length was suggested to occur in cis, with TRF1 affecting telomere length at each chromosome end (163,164). According to this model, long telomeric tracts recruit more molecules of TRF1 that will inhibit further extension by telomerase. As the telomere shortens, less TRF1 would be associated, and at some critical length telomerase would gain access to the telomere end and extend the telomeric tract, or in somatic cells, the cells would senesce. The number of TRF1 molecules bound to the tract could potentially serve as a mechanism of maintaining tract length and of recruiting telomerase. This type of mechanism is seen in yeast, where yRap1 may serve as the tract length-counting factor (165). It also remains possible that TRF1 affects telomere length by controlling the rate of telomeric erosion. The physical mechanism by which a higher density or greater number of TRF1 molecules along a telomeric tract could function to sequester the telomere end from telomerase is not described in these models. TRF2 can also negatively regulate telomeric tract length (166). Overexpression of TRF2 results in telomeric erosion at a relatively fast rate (47-87 bp/PD). TRF2 accumulates on the telomere in a length-dependent manner, suggesting a role in the negative feedback loop of telomere length regulation. TRF2 has a direct role in protecting chromosome ends that may strongly influence the regulation by controlling access to the telomere end. In mammalian systems, a telomeric looped structure (t-loop), formed between the duplex tract and the single-stranded overhang, serves to protect the telomere end (discussed below) (29). In studies using a dominant negative allele of TRF2, TRF2 has been shown to be involved in telomere end protection (167). When expressed in cells, end-to-end chromosome fusions have been observed. At the fusion site, telomeric repeats have been observed, suggesting that the loss of end protection, and therefore chromosomal stability, is not due simply to loss of the telomeric DNA. Instead, the chromosomes lost the G-rich 3' overhang. Finally, while some cells entered senescence, others underwent p53/ATM-dependent apoptosis (168). Together, these results support a role for TRF2 in the formation of a specialized structure at the telomere terminus (discussed below). In addition, they raise the possibility that apoptosis or senescence can be signaled by a lack of TRF2 binding to the telomere that might occur owing to shortened telomeres. The ability of TRF1 negatively to regulate telomere length is mediated through interaction with TIN2 and potentially with tankyrase (117,169). Overexpression of wild type in TIN2 does not alter the length of the telomeric tract substantially, although a slight decrease is observed. Expression of mutants of TIN2, which retain the TRF1-interacting domain but lack either the C-terminal or N-terminal domain, result in an increase in tract length from 3 kb to more than 15 kb even though telomerase levels are not affected. These results lead to the conclusion that TIN2 modulates telomere length through an indirect inhibition of telom-erase. Since TIN2 does not displace TRF1 upon association, TRF1 alone may not control telomere length. Instead, TRF1 may function to recruit TIN2, which is then able to modulate tract length.